In this next MDaemon 13 Beta post I want to look at one completely new feature and another that’s more of an enhancement to an existing feature. If you’re a WorldClient user who often sends out the same set of files, product brochures and price lists for example – keeping a local copy on every PC you use can be a chore. Typically this would require you to carrying around a pen drive or set up a shared document store like Dropbox or Google drive to gain access to these files from any location, but both of these methods have their limitations. Pen drives can get lost or stolen and are a potential security risk, while online shared storage services require you to download a local copy before you’re able to attach it to a WorldClient email, which is time-consuming. 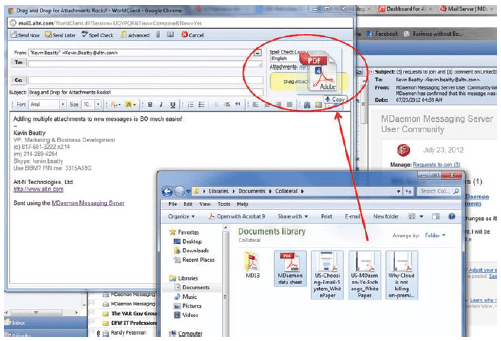 MDaemon 13 sees the first iteration of a new document sharing feature which helps you keep a quickly accessible copy of all the regularly used documents that you may wish to attach to new email messages. The common file attachments exist on the MDaemon server so there’s no need to pull them down to the client machine you’re using, the delivery is also much quicker. 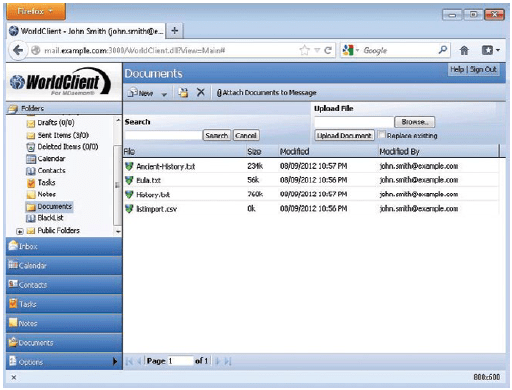 Document sharing provides a set or shared folders that can have user access controls defined in the same way as public and shared folders which allows groups of users to share and keep different documents private if required. There’s also a handy search feature to help find specific documents in larger document stores. By keeping just one copy of a file in the document store, there is less chance of a member of staff sending out an outdated version of the file. once the file is updated and replaced all users who see it will automatically have the updated version to attach to new messages. What can separate the experience of using a Web based email client such as WorldClient as opposed to a desktop email application, is the lack of interaction with the operating system. Easy attaching of documents via drag and drop to the compose Window is one such feature that we’ve been asked for a lot in MDaemon. It’s always been possible to drill down using the file browser, but adding multiple documents in this way could be a little clunky. Now in MDaemon 13, WorldClient users with HTML5 supported browsers ( e.g. Chrome and Firefox) can simply drag and drop attached files into the message and have them attached automatically. A simple but handy feature that helps us take another step towards moving away from the local email client.